on my mind for several weeks. 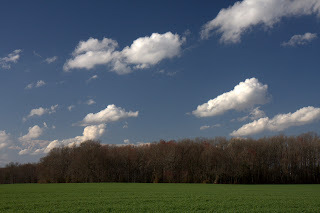 I knew I wanted to get the incredibly green grass, with a band of trees and deep blue sky... This morning started out as a foggy mess. I'll post pics of that later, but this after noon it really cleared up, with pretty poofy clouds in the sky. I knew I had to try for this.. and here it is!